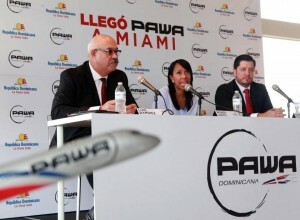 MIAMI - When Dominican airline Pawa Dominicana begins flying between Miami and Dominican Republic capital Santo Domingo in November, it will mark the first time in more than two decades that a commercial Dominican airline will offer flights to the United States. The airline announced the new route Wednesday, including plans to operate two daily flights from Miami International Airport beginning Nov. 16. The route will also serve as a connector for flights to Curacao, St. Maarten, Antigua, Puerto Rico, Aruba, Haiti and Cuba. Pawa, formerly a subsidiary of Pan American World Airways, has been in operation since August 2015 and operates 160-seat MD-83 and 110-seat DC 9-32 aircrafts. Miami flights leave MIA at 5:15 a.m. and 2:30 p.m. every day. Fares start at about $320 roundtrip in November, slightly cheaper than competitor rates during the same month. “Pawa offers a different experience focusing more on the human aspect of customer service, featuring the broadest variety of ticket sales channels and better service for passengers with the typical Dominican warmth, both on board and on ground, as well as a punctuality rate that on average has exceeded 93 percent during our first year of operations,” said Daniel Castillo, Pawa Dominicana’s U.S. country manager, in a release. According to MIA, the Dominican Republic is the airport’s fourth-busiest international market, with more than a million total passengers annually. On Sept. 30, the airport also welcomed Dominican-based charter airline Dominican Wings, which is already offering weekly service to Santo Domingo and Punta Cana. The Dominican Republic is Miami’s No. 24 international market, responsible for attracting nearly 22,500 tourists in 2015, according to figures from the Greater Miami Convention & Visitors Bureau.